WHAT YOU'LL BE EATING IN 2018! This year bought us the taco fever, the rainbow revolution, unicorn uprising and many more uniquely 2017 food trends that will forever have a place in our hearts (and nightmares.) But onto bigger and better things; what food trends are going to make their mark on the new year? 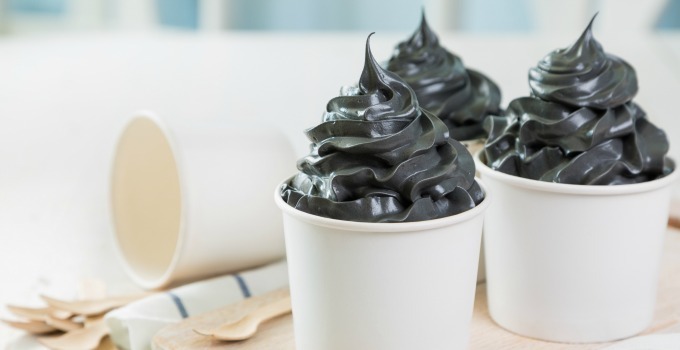 To counteract this colourful year of rainbow vomit and unicorn themed foods (BE GONE), the rise of black or charcoal foods is predicted to leave us shooketh in 2018. With creations such as charcoal ice cream, burgers and hot dog buns we’re in for a crazy year ahead of us. Many are trading forces and heading to the dark side to reap the proclaimed detoxifying and health benefits of the activated charcoal – we just think they look damn cool. So, channel your past gothic self (…we’ve all been through that phase) and buckle up. You couldn’t look anywhere in 2017 without seeing #fitspo and #healthspo plastered around, but 2018 is all about being healthy AND environmentally conscious – upcycling is the new black. Reducing our waste through using products that would usually be discarded, such as imperfect fruit and veg in pressed juices is SO on trend. Imperfect food because we’re not all perfect right? Here’s to a cleaner new year! Okay, let’s be real. Who didn’t order UberEats or Deliveroo this year? It’s the perfect solution to combating hangovers, facilitating our laziness and celebrating our disregard for pants ! So, in 2018 the expected rise of meal kit subscription services can provide healthier alternatives to these services, with the ability to make the dishes ourselves. No supermarket wars or meal indecisiveness, it’s all delivered to your door. A balanced diet without the stress of sourcing healthy, clean food all year ‘round? We can be lazy AND healthy? Sign us up! Let’s spill the tea and indulge in a predicted trend of 2018. A tea tyranny is expected to run rampant in the new year. Supposedly tea is going to begin to replace coffee, and with more tea bars and specialised tea shops popping up all over Australia this craze might soon become a reality. Pretty tea-riffic right? So, thank you 2017 for your flavoursome foods, but let’s bring on 2018 and all it has to offer our eyes, nose, mouths and stomachs! Words by Teshaya Turner – the gourmand with her finger on the pulse.